There has been a terrible tragedy in Ohio. A young man went to Chardin High School and started shooting at the students. Three were killed and another two have been hospitalized. Naturally, the Left has lost no time in exploiting this crime in order to push gun control, as witness this editorial in the Louisville Courier-Journal. This editorial, which they titled “Gun Insanity” is shameless and more than a little dishonest.I’ll give a few excerpts. The shootings Monday at a suburban Cleveland high school that have now claimed three students’ lives will evoke widespread grief and horror, as they should. They will produce a search for motives and explanations, and there are already hypotheses regarding the teen-age shooter involving bullying, isolation and undetected personal problems. There will be discussion of the role of parenting and social media in such tragedies.What one can be absolutely certain of in today’s America, however, is that no serious political or public pressure will be brought to bear on the national madness that makes such slaughters not only possible but inevitable: an addiction to guns that is so sweeping that it all but prevents limiting access to firearms even by the millions of disturbed American adults and adolescents. The Second Amendment has been twisted? Here is that amendment in its entirety. I don’t see how anyone would get the idea that the Second Amendment allows gun ownership, except that it is stated in plain English. The only people doing the twisting are activist judges who state the amendment means the precise opposite of its actual words. Now, as to the level of gun deaths in the United States. I agree that too many people are murdered in this country. I wonder though, if the editors of the Courier-Journal have bothered to examine the evidence that the increasing number of states with concealed carry laws have been associated with lower crime rates, and see this chart. They might have noticed that the jurisdictions with the strictest gun control laws have the highest crime rates. They might also have observed that since Britain all but banned private ownership of firearms, the crime rate there has been exploding. The editorial does end on a high note, at least to me. No matter. There is no political will even to ban assault rifles and rapid-fire guns. Proposals to register guns, just like cars, don’t even get a hearing. States’ rights advocates perversely insist that local and state gun-control laws be superseded by higher authority. Thank goodness. This, like so many other issues today, is a freedom issue. I mentioned last Wednesday that it is common for Catholics and others to give up something for Lent. Most people choose to give up some luxury or maybe a favorite snack. Some choose to make real sacrifices, like this woman has by giving up Facebook. This story is from the local Chicago CBS affiliate. One Chicago woman decided to give up more than the usual when Lent began on Wednesday. As WBBM Newsradio’s Bernie Tafoya reports, some people might be inclined to give up sweets, pastries, candy or alcohol during Lent. But Christine Melendes has decided to give up Facebook. Melendes says she has been used to using Facebook every day for the past five years. She says she has been very active on the social networking site since 2007, posting status updates and pictures and checking what others have posted. Melendes thinks she will learn something about herself by going without Facebook until Easter. “Probably how much I use it, and how much I use it to stay connected to my friends and my family,” she said. Melendes is not giving up all social media, however. She says she cannot stop using Twitter along with Facebook. “That would be impossible,” she said. What did we do with ourselves before Facebook and Twitter? Today is Ash Wednesday, which begins the forty-day period day Lent in the liturgical calender. 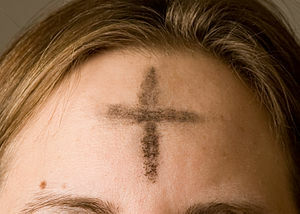 Ash Wednesday is celebrated by many denominations, including Catholics, Anglicans, Methodists, and even some Baptists. Ashes are placed on the foreheads of the celebrants in the shape of a cross, hence the name. The ashes are traditionally from the palms from the previous Palm Sunday after they were burned. As Lent is a period of repentance and fasting, the ashes symbolize sorrow for the sins committed. But who could supply the deficiency? Even if a man-and he would have to be a far better man than I- could scale the spiritual heights required, what “answerable style” could he use? For the style would really be part of the content. Mere advice would be no good; every sentence would have to smell of Heaven. Jim Peschke might perhaps be thought a fool for trying what a master like Lewis feared to attempt. 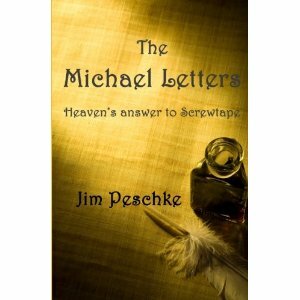 He suffers from at least two disadvantages that should make a book like The Michael Letters a failure. First, Peschke, by his own admission, does not have the satirical wit of Lewis and is only a novice writer. Second, human nature being what it is, is more attracted to the darkness than to the light, and so the diabolical is inherently more interesting than the angelic. Despite these disadvantages, The Michael Letters succeeds beyond all expectations. The correspondence between the guardian angel and the archangel holds the attention of the reader and the story moves along briskly. If this book does not quite come up to the level of The Screwtape Letters, it more than satisfies. There are, of course, fundamental differences in the two works. The angels, unlike the demons are genuinely interested in the welfare of the human in their charge. Peschke shows this by giving the human a name and including details of his everyday life. Screwtape and Wormwood did not care about any such details. Their “patient” was simply food to them. The whole flavor of the correspondence is entirely the opposite. Unlike the demons who hate and mistrust each other, the angels willingly help and encourage their fellows. These and other differences make The Michael Letters a fitting counterbalance to The Screwtape Letters. I am not sure how it happened, but somehow I have managed to sign up for the Truth Team. Welcome to the Truth Team tipsheet. You signed up to be part of the team that fights back, and there’s no time to waste. This is the first of regular updates we’ll be sending with actions you can take immediately to help support the President — to debunk false attacks and make sure folks hear about what we’ve accomplished. Here’s how it works: We’ll round up the best of our posts and turn them into short items, with Facebook and Twitter buttons after each so you can instantly share them with friends and family as you go down the list. Every day from now until November, there will be misleading news stories, attacks, and flat-out lies about the President’s record. It’s our job set to them straight — and nothing works better than the truth, backed by sound sources. Fight back by spreading the word today. I would have thought these people would have learned their lesson with attackwatch. Of course this time they are not asking people to snitch on “attackers”. You are just supposed to repeat the Obama campaign’s talking points to all your friends. I think I can do that. Zombie at PJ Media has a humorous take on this, The Truth Team Comics. He should be careful though. Jack Chick is not amused by people who use his comics for parodies. Speaking of the previous subject, I saw a letter in the Louisville Courier-Journal which illustrates the intellectual confusion that many seem to have on this subject. I don’t honestly know if the writer is being deliberately obtuse or if he really doesn’t get it. Here is an excerpt. As staunch Americans who believe in the fundamental and individual independence of citizens, my wife and I believe that each individual has the God-given right to practice their own religion according to the dictates of their own conscience. History tells us that the founding of this great country was powerfully based on the freedom of religion. Remember, too, that the freedom of religion doesn’t just mean the freedom to practice your own religion(s). It also means the freedom from the practices of someone else’s religion. As a married couple, we decided not to have children. This decision will cost us $38,000 (according to the numbers on birth control put forth by the White House recently, and our own calculations of actual birth control costs). Religiously influenced legislation against free access to birth control currently being introduced into Congress abrogates our rights to practice our religious beliefs according to our own consciences, by enshrining one group’s religious-based arguments into law. Our religious beliefs do not agree with this attack on the health of women everywhere. The Catholic Church should no more be allowed to dictate the availability of birth control, than imams should be allowed to dictate criminal case law. Rabbis should not be allowed to ban pork and shellfish to all Americans, nor should Methodists be allowed to ban bourbon from the shelves of every store in America. But the Catholic Church is not dictating the availability of birth control. The Church simply does not wish to be obliged to violate its own doctrine by government fiat. The writer states that he and his wife believe in religious freedom, yet they would deny the Catholic Church the right to practice its beliefs. The more accurate similes would be an imam forbidden to preach Islam, a rabbi forced to provide ham sandwiches to his synagogue, or the Methodists required to support the local taverns. I think that people on the Left simply have an immature concept of freedom. They seem to believe that they should be free to do whatever they want, and everyone else should be free to provide them what they want. Freedom for me but not for thee.